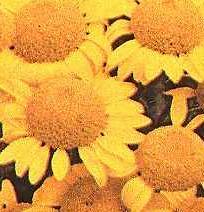 Perennial members of the Daisy family, Compositae (or Asteracea) and native to Europe, parts of Asia and Iran. 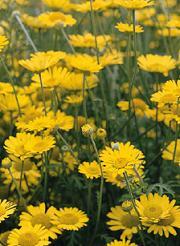 Anthemis are excellent plants for the flower border and rock gardens. They have fernlike leaves and bear daisy like blooms of many colors and many have large blooms which make excellent dried flowers as they retain their colors. They are also very valuable as herbs and dye plants. 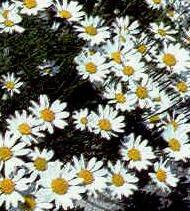 Anthemis are fragrant, being Chamomiles (Anthemis nobilis is also known as Chamaemelum nobilis See Chamomile ) , and have the same aroma, as well as the same common name. The plants thrive in medium well drained soils in a sunny position, and do not live long in heavy clays, so heavy soils should be lightened with peat, compost, or sand for best results. Propagation is done by lifting and dividing existing plants or by sowing seed. Seeds should be sown in spring in a light mix of sand and peat. The seeds are very small and should be surface sown and covered with plastic or glass. Keep moist at about 68-75F. Transplants should be planted outdoors only after all danger of frost has passed. Medicinally, a tea is made from the flowers, leaves or stems of A. tintoria which has been used to treat cancers, as a stimulant and as a tonic.